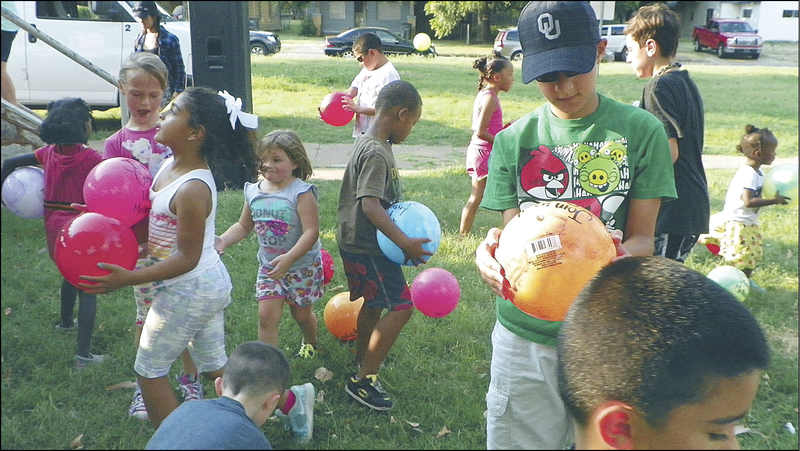 Scampering kids collect balloons during a Union Park summer picnic sponsored by Lawton-Centenary UMC. In Lawton, Centenary United Methodist Church celebrated the success of two summertime neighborhood missions with a grand community picnic June 23. Held in Union Park, the free picnic included a hot dog cookout with much of the food donated, a concert in the bandstand by the Centenary Connect Band, and special visit by the Patriot Guard Bikers on their motorcycles. The park and Lincoln Elementary School are both part of Centenary’s neighborhood. The church’s Lincoln Summer Enrichment Program targeted second- and third-graders. Centenary received a $1,000 grant from Lawton Public Library. About 25 church volunteers plus the new principal and some teachers at Lincoln worked with the students. An animal rehabilitation expert, a string-art performer, a working cowboy, a dedicated musician, and two computer teachers were important in the leadership as the students received help in three areas: reading, enrichment, and computer learning. The second program was Centenary’s Vacation Bible School, with a "Heroes" theme. VBS attendance doubled over 2016, thanks in part to intentionally reaching out to Lincoln students. Sarah Riddle, the church’s Mission Team chairperson, said the "super heroes" of Centenary dedicated countless hours to create and present the "powerful outreach projects."